Learning to live happier through the power of 15. So my bathroom can be relaxing or stressful depending on the cleanliness of it. We have two full bathrooms but only really use the small one. Trying to convince my family that not everything has to go in the small bathroom was hard at first but has gotten easier as we’ve all learned that it functions better when only what we use on a regular basis is left in this room. Here is what you see when you are walking towards my bathroom. 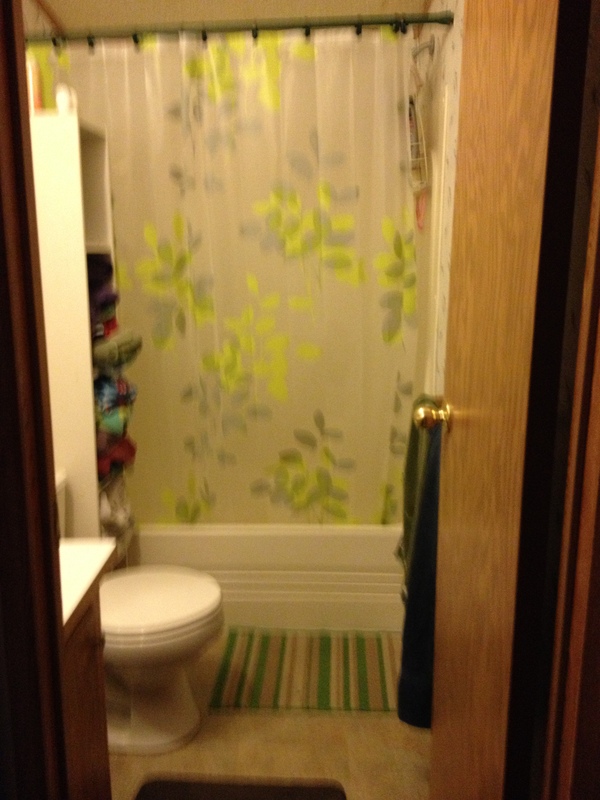 It used to have a really dark, thick shower curtain. I thought it over powered the room so I switched it out for a thinner lighter curtain. I really love the colors in this curtain. We have two rugs – the dark brown rug is super soft and foamy. it was by the shower but i found that it stayed wet forever and when the bottom got wet it became a slippery death trap so I just switched them and crisis was averted. I love the stripes and the green and brown one. 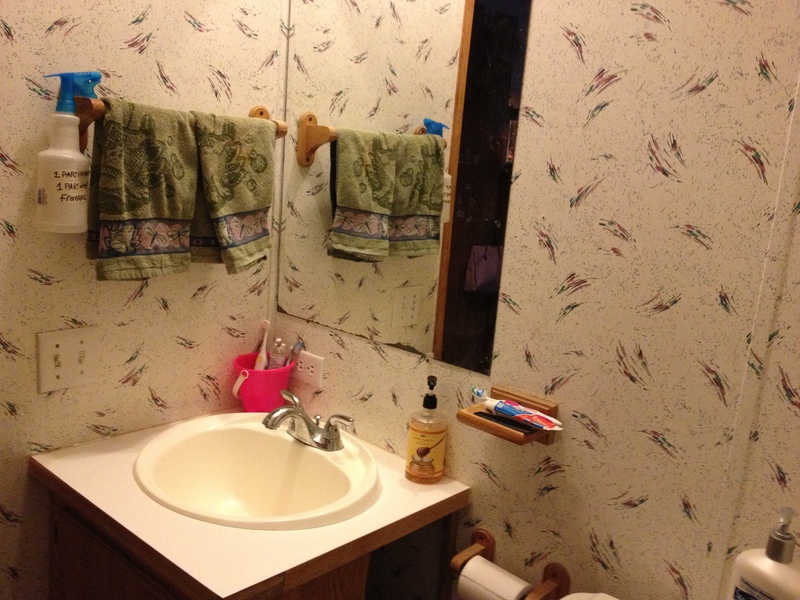 there is a towel bar with two towels on the right. There is a partial towel bar above it that needs to be taken down and gotten rid of. The shelf is a new addition but not a new purchase. 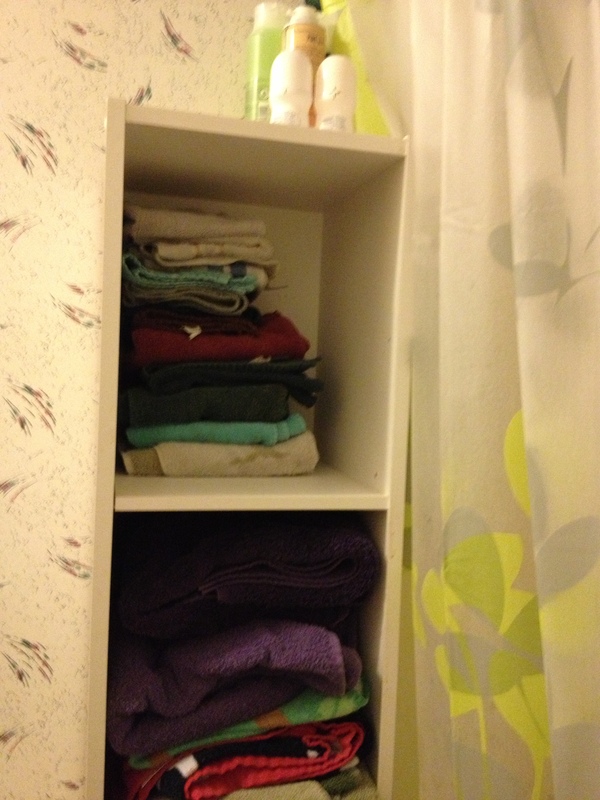 Our towel shelf was in the big bathroom but we don’t use that bathroom. this bathroom is right next to our bedrooms. It was a real pain to get a clean wash cloth or towel and it didn’t make sense to carry the clean towels all the way to the big bathroom just to have to carry them to the small bathroom. 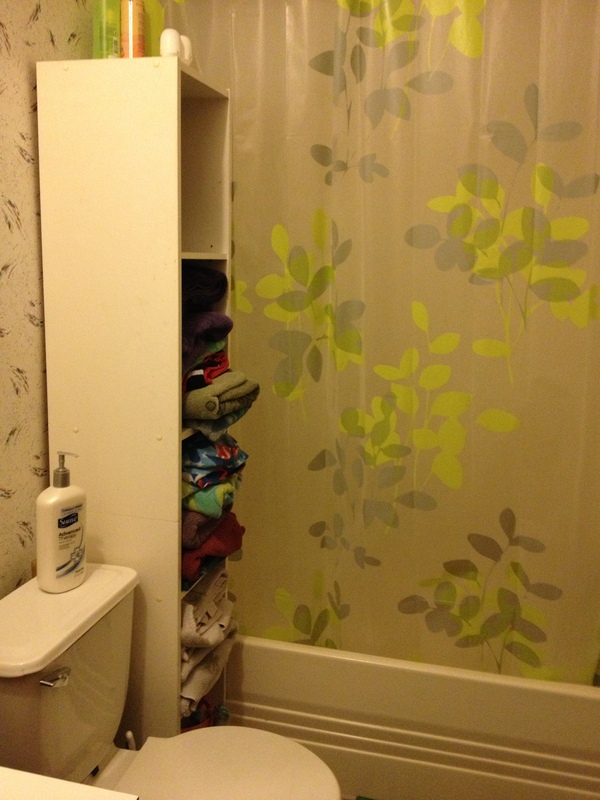 I’m quite happy with the shelf in the smaller room – my mom was surprised that it fit as the bathroom looked too small to fit anything let alone a shelf. to me the bathroom looks cozier now the shelf is in there and i actually put the towels away now instead of leaving them on my dresser. On the toilet is my new favorite lotion – Suave Advanced Therapy. It feels great and doesn’t overpower with scent. It’s been saving my hands this winter and I’ve been applying it after washing my hands. This lotion is fantastic! 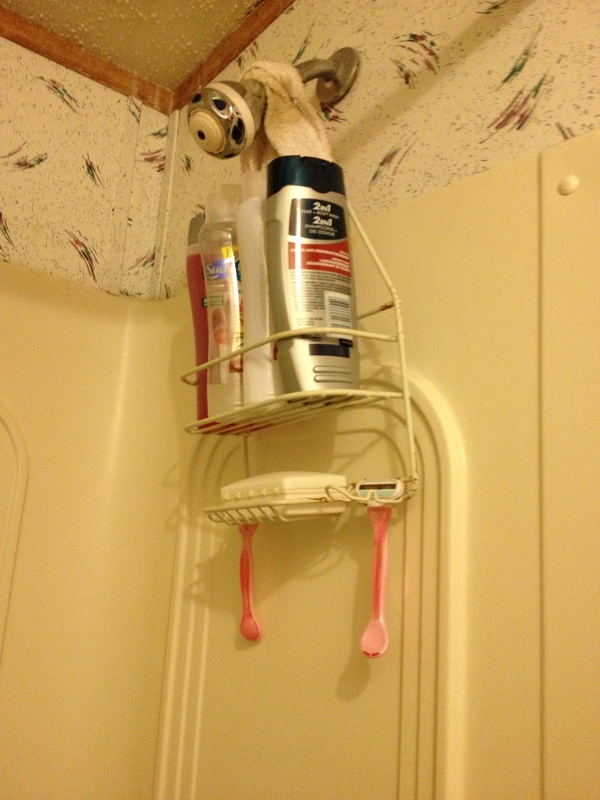 I have Suave conditioner and shampoo on top of the shelf – apple scented, and my shaving cream. My daughter has two Avon bath paint roll ons. Now I don’t typically use Suave but am really loving on it right now. It smells good, works good and is way more affordable. I also admit to owning too many wash cloths, hand towels and towels. I don’t even have them all pictured because there are towels in the wash and in use. Three shelves of bath towels, a shelf with hand towels and washcloths and one shelf for my daughter’s bath toys and some bubble bath. 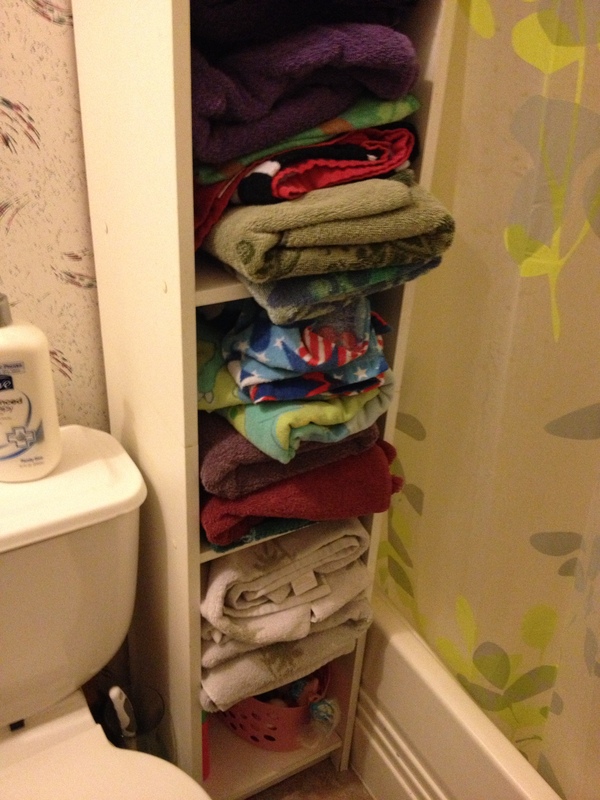 So there are at least 5 towels per person in this house. What I would really love is to donate most of these and get myself a matching set of luxurious towels instead of this mismatched bunch. Aldi had a wonderful for about $20 but I would have needed 2 sets. I couldn’t justify spending $40 on beautiful towels when I have plenty of good ones at home. Eventually I will replace though. Hidden is the toilet plunger and the toilet brush. I converted a vase into a brush holder. I keep the brush soaking in a vinegar solution with dawn dish soap and lavendar oil so it smells good and soap is always ready to clean. Here is my sink. My family loves to try to junk it up but it always gets removed. hand towels, my bathroom cleaner (vinegar, water and essential oils), hand soap, toothbrushes, toothpaste, floss and my husband’s comb. I like to store the toothbrushes and such in the pink bucket to make it easy to stash underneath when guests come over. – yes I hide my toothbrush. My daughter and my hairbrush are absent from the bathroom because we don’t brush our hair in there. Also absent is any make up as I never wear the stuff. 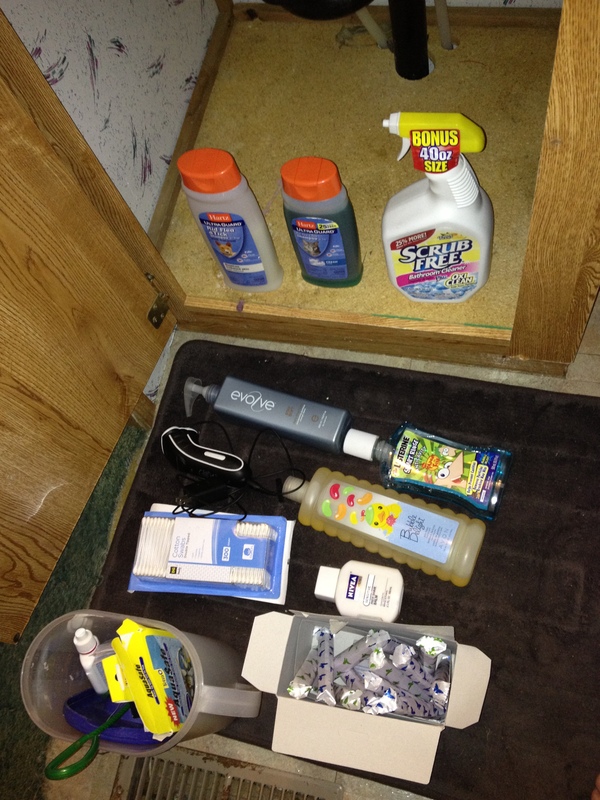 My facial wash and moisterizer and contact solution is on a shelf just outside of the bathroom. I find too much stuff on the sink makes it messier and harder to clean. Just in case you thought I stashed everything under the sink – bubble bath, my husband’s face lotion, my daughter’s mouthwash, an extra bottle of shampoo, husband’s razer, two boxes of q-tips (i’m addicted), tampons, my daughter’s fish tank necessities, flea shampoo for both cat and dog (though we don’t use it in favor of blue dawn dish soap) and a scrub clean bathroom cleaner. I could easily part with the cleaner (if favor of my homemade cleaner), the flea shampoos and the evolve shampoo but my husband said that it doesn’t make sense to get rid of it when we could use it. So my plan is to use it and not replace it. I’ve also decided that when my daughter’s fish eventually passes away we will not be replacing him or her. In the shower itself a shower rack with Suave shampoo and conditioner (coconut), Suave body wash (apple), my husband’s bar soap and his shampoo. I noticed that I have two razors – hmmm 1 to purge. And finally – wall art mostly gone. 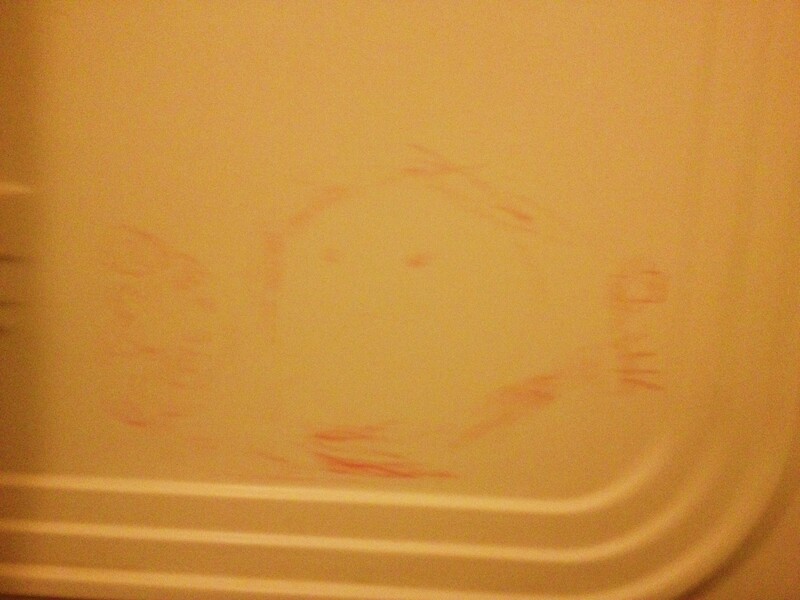 We bought bath crayons and I learned that if you don’t remove it right away that it almost becomes permanent. My daughter fully decorated the walls one day and I loved the drawings so asked her to keep them. Nothing worked on getting it off time i used baking soda and my vinegar cleaner. I had the rest removed and almost had this one gone but then stopped myself. It’s a picture of me smiling with my arms outstretched to give her a hug and I am holding flowers for us. I love it and it makes me happy! Cooking, Meal Planning, What's for Dinner?